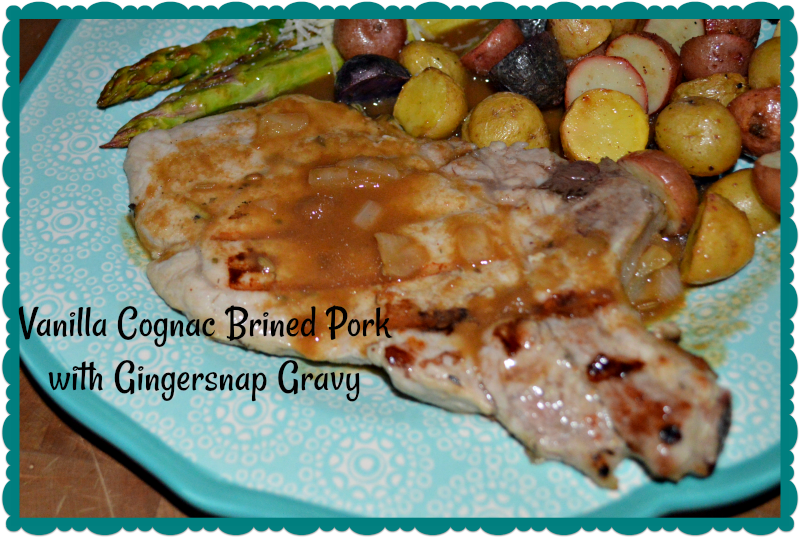 This recipe originated from the Southern Living cookbook, Off the Eaten Path as Vanilla-Cognac-Brined Pork Tenderloin with Gingersnap Jus. It’s from the Krazy Kat Restaurant at The Inn at Montchanin Village in Delaware. I made just a few changes to work with what I had on hand and really liked them so will keep the changes for future meals. Whisk together everything except the pork chops. Place pork chops in a Tupperware marinader or ziplock bag in a bowl (in case it leaks). Add brine mixture and close, marinading for 24 hours. If using the Tupperware turn it over every few hours. Begin gravy before grilling chops. When ready to grill, drain pork chops of all marinade and pat dry. Grill 3-5 minutes preside depending on thickness until 155˚. Let meat rest under foil 10 minutes. Pulse cookies in food processor until finely ground. Heat oil in sauce pan over medium-high heat. Saute’ shallot and caraway seeds until onion softens. Add wine, vinegar and broth. Slowly whisk in cookies and molasses until well blended and gravy thickens.